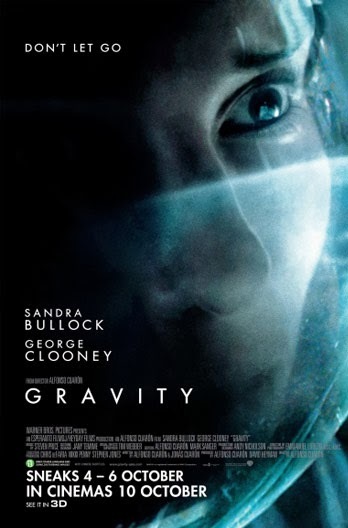 Academy Award winners Sandra Bullock and George Clooney star in "Gravity," a heart-pounding thriller that pulls you into the infinite and unforgiving realm of deep space. The film was directed by Oscar nominee Alfonso Cuarn ("Children of Men"). Bullock plays Dr. Ryan Stone, a brilliant medical engineer on her first shuttle mission, with veteran astronaut Matt Kowalsky (Clooney) in command of his last flight before retiring. But on a seemingly routine spacewalk, disaster strikes. The shuttle is destroyed, leaving Stone and Kowalsky completely alone - tethered to nothing but each other and spiraling out into the blackness. The deafening silence tells them they have lost any link to Earth - and any chance for rescue. As fear turns to panic, every gulp of air eats away at what little oxygen is left. But the only way home may be to go further out into the terrifying expanse of space. While the (many) reviews for this movie were good, I've had friends who said it was boring - the whole movie only has two actors in it (since it's in space and survival and all that) who are stranded in space while on a routine mission and have to find their way back to earth or risk being lost forever in space. I was apprehensive when Ryn suggested watching because of the rave reviews, but ended up watching it anyways (sans 3D) and it was better than I expected. Yes, the storyline is pretty much predictable and just as its progression exactly as its synopsis says it is, but it is the human emotions being out in space alone and enduring, even fighting for survival just to find a way back home (to earth) that is what really fuels this movie. For those who enjoy a good book, or are able to put themselves in the shoes of the characters (imagining how it must feel being stranded in space and with almost no way back home) struggling and eventually overcoming the fear of being alone and the lonely silent darkness. The movie starts off light-hearted with 3 astronauts up and about in space doing a regular mission, when they are informed of incoming debris of a destroyed satellite coming their way. Before the astronauts can regroup back to their shuttle, the debris hits them leaving Stone (Sandra Bullock) and Kowalsky (George Clooney) completely alone - tethered to nothing but each other and spiraling out into the blackness. Their fellow astronaut has been hit by the debris and part of his face is defaced. Stone and Kowalsky bring the body of their colleague back to their shuttle, only to be met with the destroyed shuttle and the demise of their fellow colleagues on board. To make matters worse is the deafening silence from their communications system indicating that they have lost any link to Earth, along with any chance for rescue. Stone and Kowalsky then decide to head to a nearby Russian station for oxgen and and get to an escape pod. Although they manage to reach the station, the shuttle pod has already been deployed, so their next best chance at getting back home is to head to another nearby Chinese station (or something similar), get to the escape pod and head back to earth. It is at this juncture that the debris from earlier starts to hit the station and Kowalsky gets separated from Stone, but not before telling her that she has to be the to make it back home to make his sacrifice worth it. Fear soon turns into panic, as every gulp of air is precious; depleting what little oxyegen is left and the only way home (to earth) is to venture out into the terrifying expanse darkness of space. Stone is devastated and she struggles with her inner turmoil as she makes it to the landing pod to propel her towards the Chinese station. After much struggle, she reaches her destination and figures how to operate the pod before the traveling debris reaches her. It is a fight against time as the escape pod she is in is tangled up, but she manages to make her escape just in time. Overall, it was an emotionally griping movie and Sandra Bullock did a wonderful job portraying Stone's inner turmoil, anguish and fear and how she overcomes that comes to cherish life more than ever before. That said, I can also understand why some of my friends found it boring: with Stone being the only character left, the movie was practically all about one person trying to find her way back home and alot of talking to one's self. There are no fancy action scenes (though the visuals of space and choreography were beautiful), and the number of characters is minimum. Ryn, having read the rave reviews, was a little underwhelmed. So perhaps it could be said that we should really take reviews at face values and go watch a movie with a little an expectation, so that at least we can be wowed or be pleasantly surprised with the outcome.